/ Modified sep 15, 2017 2:58 p.m. The effort aims to increase the accessibility of newspapers that provide a window to the transition to early statehood and beyond. 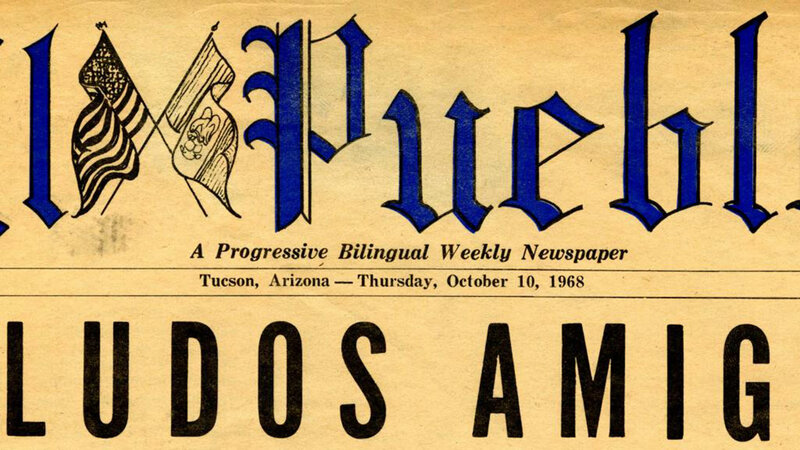 Nameplate of El Pueblo, a bilingual (Spanish/English) newspaper published in Tucson, Arizona from 1968-1969, from the Historic Mexican & Mexican American Press collection. An infusion of funding is turning the page in an effort to digitize historic newspapers in Arizona. The project dates back to 2008, and has seen the digitization of 68 titles comprising, so far, around 380,000 pages of newspaper collections that date from when Arizona was a territory through the transition to statehood, according to a release. The National Endowment for the Humanities has given the Arizona State Library, Archives and Public Records and the University of Arizona $279,000 to continue the project, which aims to make the material more discoverable and accessible. The next phase will aim to fill in some of the gaps left by the first rounds of digitization, which focused mainly on English-language titles, according to the University of Arizona Libraries. The libraries hope to expand the scope to papers like El Tucsonense, published in Spanish between 1915 and 1959. Further targets for digitization include collections or titles that reflect border-town newspapers, African American news, Native American news, and World War II internment camp newspapers.